April Fools seems to have become a big marketing day with retailers because I've received multiple joke promotional emails yesterday, the cutest a new Brooks line of run shoes for dogs. 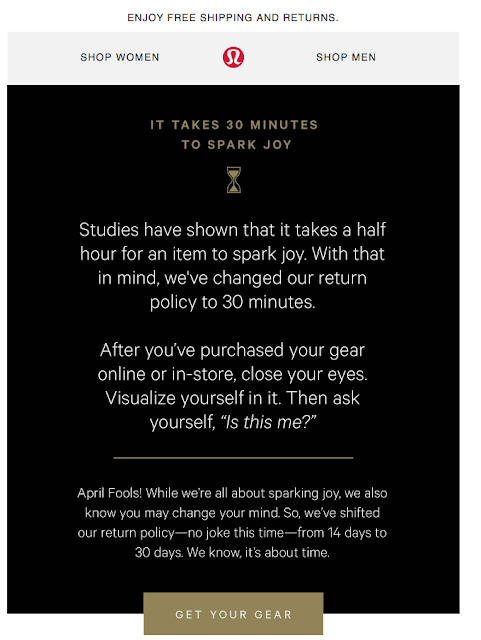 The lululemon email is an interesting development - they're going to a 30-day window for returns, increased from the long-time (forever?) 14-day window. One of my bootcamp buddy's biggest complaints about the brand was the 14-day window. However, I'm not sure this will result in her spending any more since she loves shopping markdown racks and hates the final sale aspect of those. I'm not sure whether it will change my buying habits since I tend to buy to keep, though I know a ton of women are catch-and-release type shoppers. Once I get something home I like to wear it right away but I know my husband can keep the tags on something for months. I wonder whether the 30-day return window means they won't be updating the website with new product on weekly basis anymore. That was always the justification for the short return timeframe. Athleta rolls out product on a more spaced out basis, though items do seem to trickle in weekly after the catalog goes out, but they have an open-ended return policy - the website says return any time and they tell people they can try the product and still return it if they don't like it. Nike and Carbon38 have 30-day return policies so I suppose this helps align lululemon with their most threatening competition. But will they change the all-too-common hassle you get in the stores whenever you try to return something? That's much more of a deterrent to me than the 14 day window. I can't even remember the last time I bought something from there! I don't see this affecting me very much. My birthday is coming up, and I've started asking for Athleta gift cards instead of Lulu for the first time ever! Who cares anymore. I am so done with this lousy company, the April Fools was a little too snarky for my taste. Knowing how they treat us as long time customers, the joke isn't funny. They really think we are a bunch of dimwits. @anon 2:53- I've been very lucky that my store is similar too. I've always been able to exchange easily outside of the 2 week return window (but I've never tested out a year before, lol!) I've been able to return a WMTM item without issue if there is a problem with it, like it arrived with an undone seam, not as described or the sizing was clearly a whole size smaller than marked. I agree that I've always felt that if I asked for an exchange rather than a straight out return, they don't care as much. Customer service is not great at all. Off topic, does anyone know if they discontinued the Free To Be Wild bra? THAT is what is missing from the Lulu these days...the whimsy! The silly! Many of the fitness brands (even Athletica) seem to take themselves too seriously. LLL's clothes were technical but still had that fun element to them. Nowadays, the brands are all sleek and serious. Oiselle (women's running brand) has a brand attitude that reminds me of the old Lulu, but the clothes do not. I've read that Lulu doesn't have enough colors, and that is causing poor sales. Apparently they're planning to add colors in response! What is your take on this? Thanks! @Emory - there is a big discussion a few posts about this. Color will help but blah, boxy designs aren't helping their sales, and the quality is going downhill, too. It is about time but it will not change my current buying habits causing me to purchase more, again. I always left the tags on the new item up until the return window and would return it if I changed my mind. Going so far as to put a reminder in my calendar. I'm in Canada and I have only had good return experiences (even with a jacket from wmtm - they gave me a gift card), but I know of some hassles so I try to follow the return period etc. At least if I buy anything now, I'll have more time to consider it but it usually doesn't take me that long to arrive at the decision of "that's going back" haha. A lot of retailers do final sale on marked down items. However, what LLL could do to gain some ground, is that if it is purchased online from wmtm, it should be permitted to return with no hassle. You can see this in reviews of an item where someone (or many people) ordered their TTS and it completely did not work out due to the fabric, cut etc. If you don't have the opportunity to try it in store, there should be some sort of policy that you can return for an exchange if item size still available or store credit. I know some people get this today either easily or have to fight for it, but you should not have to fight for it.